Get the Full StoryThe under-fire congressman argued there was a conflict of interest in allowing Navy SEALs to train in MMA gyms. 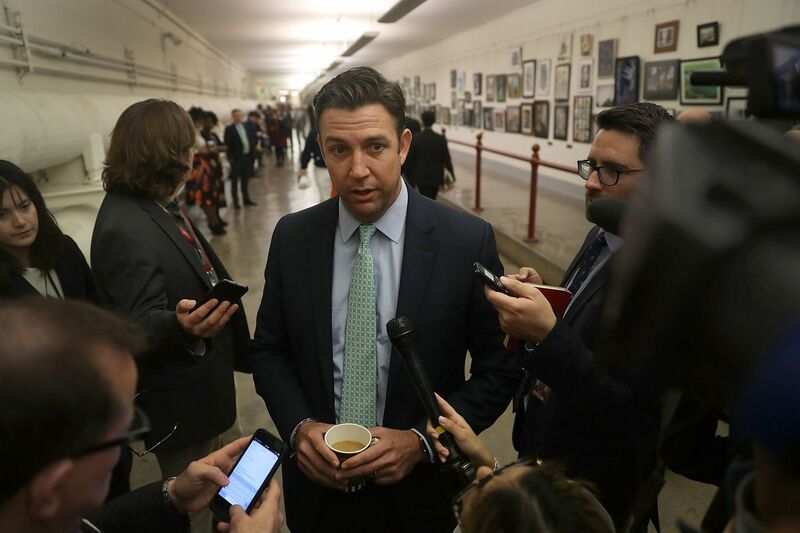 On Tuesday, CNN reported that Republican congressman Duncan Hunter, who represents California s 50th District, and his wife Margaret Hunter had been indicted on charges including wire fraud, falsifying records, campaign finance violations and conspiracy. The 47-page indictment produced by the U.S. Department of Justice DOJ alleges that the Hunters misused 250,000 worth of campaign funds and used it pay for a lavish lifestyle. Among the purchases the DOJ cite are a 14,000 vacation to Italy, a 6,500 trip to Hawaii, and a 3,700 trip to Las Vegas and Boise. Other purchases under suspicion include beer, wine, alcohol and grocery purchases totaling 9,000 and spending at Costco totaling more than 11,300. The indictment also alleges that the Hunters tried to hide their illegal spending by pretending the purchases were for charities. Hunter s district in California, which spans parts of San Diego county, has been staunchly Republican since 2003. The district, which is home to a large number of military families, is to be contested in November s midterm elections. Hunter s opponent is Democrat Ammar Campa-Najjar, who is a former Department of Labor aide from the Obama administration who has out-raised Hunter during this current election cycle. At their arraignment on Thursday the Hunters pleaded not guilty to the charges. According to CBS News bail was set at 15,000 for Congressman Hunter and 10,000 for Margaret Hunter. The Hunters attorney Gregory Vega told reporters that the investigation into his clients is politically motivated. Vega said that prosecutors working the case were supporters of Hilary Clinton. Congressman Hunter, a former Marine and veteran of wars in Afghanistan and Iraq, last featured on BloodyElbow.com when he made accusations of conflicts of interest between the US Navy and mixed martial arts gyms. That story focused on the Navy Special Warfare Command s NSW 2011 decision to drop a program called Close Quarter Defense CQD , which had previously been used to teach hand-to-hand combat to the Navy s Sea Air and Land Teams SEALs . CQD was the creation of Duane Dieter, whose personal website said he developed the program after he traveled to the Orient and spoke with an elder master. The move to boot CQD revealed a clash of cultures within the SEAL community. A portion of the community were fans of CQD, calling it a bedrock of SEAL training. The contrary point of view was that CQD was old fashioned, out of touch, and not appropriate for real fights to the death. SEALs of this opinion had largely been training at MMA gyms instead. A proponent of MMA training over CQD was Rear Admiral Timothy Szymanski, who has since taken over command of NSW and operation of the SEALs. Szymanski was a member of the famed SEAL Team Six . On April 5th, 2016, just before Szymanski got the top job at NSW, Rep. Hunter wrote to then Secretary of Defense Ash Carter to campaign for CQD s re-installment among SEAL training programs. In his letter Hunter wrote that he had, concerns with consistent reports that MMA training is not conducive to SEAL operations. Hunter also wrote that he was concerned that there was a conflict of interest revolving around the decision to drop CQD in favour of letting SEALs train at MMA gyms. Hunter s argument was that former SEALs owned a number of MMA gyms and that these individuals had somehow influenced the decision. Rep. Hunter s father, Duncan Hunter Sr., was also a congressman in California. In 2010, when he was chairman of the House Armed Services Committee under President George W. Bush, Hunter Sr. lead an investigation into the SEAL community s relationship with MMA gyms. That investigation found that there were instances of wrongdoing, including SEAL members having ownership stakes in MMA gyms which was classified at illegal fraternization . These findings resulted in a round of ethics training for SEALs. The younger Hunter s concerns in 2016 were rebuffed by Lieutenant General Jacqueline D. Van Ovost, who at the time was vice director of the Pentagon s Joint Staff. In her response to Hunter Van Ovost said that boxing, Muay Thai, judo, wrestling, grappling, and Brazilian jiu jitsu were skills beneficial to Navy SEALs and that she did not support any new investigation into the relationship between SEALs and MMA gyms. Now embroiled in a scandal, it seems unlikely that Hunter will again try to drive a wedge between the Navy SEALs and MMA training. His path to re-election has been sufficiently narrowed against an opponent who was already gaining momentum. Hunter is also fending off calls for him to step down per the Los Angeles Times or to be removed from the party per The Washington Post s Editorial Board . The Hunters are considered innocent of all charges until proven guilty. For an informative guide on SEAL Team 6, read Matthew Cole s profile The Crimes of SEAL TEAM 6 from The Intercept.